The underworld history of Chicago during the era of Prohibition is well known. At the end of the 1920’s, Chicago had two rival gangs. The South Side gang was headed by Al Capone, who in the winter of 1929 was giving orders from his Miami home. The North Side gang was led by George “Bugs” Moran, at the time a resident of the Parkway Hotel. 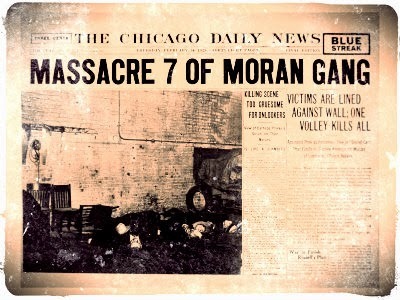 The location was convenient for Moran and his gang because it was less than a block from the North Clark Street Garage at 2122 North Clark Street, requiring a short walk out the back door of the Parkway, through the alley and across the street. The garage was used as a distribution point for the gang’s illicit liquor business. On the morning of February 14, 1929, Moran was planning to meet a hijacker at the garage to receive delivery of a truckload of whiskey from Detroit at the garage. Five other men, plus a hired mechanic who was working on a truck were at the garage. Reinhart Schwimmer, an optometrist who lived at The Pierre and was a hanger-on with the North Side gang, had also dropped in. Luckily for Moran, one of the gang members present was Al “Gorilla” Weinshank. The newest member of the gang, Weinshank’s body type and facial appearance may have made lookouts in the rooming house across the street think Moran was in the garage. According to speculation at the time, the lookouts must have telephoned opposition gang members to tell them that Moran and the rest of his outfit were in the garage and everything was ready for an assault. Nothing was the same for Moran after the Massacre. He eventually left the gang and the Chicago area and was reduced to common crimes such as mail fraud and robbery. He went to prison for four years in 1939 for conspiracy to make counterfeit traveler’s check. Upon his release, having been one of the richest gangsters in Chicago during Prohibition, he was penniless. After 1945 he spent the rest of his life in jail for his involvement in a robbery, and in 1957 died of lung cancer when he was beginning yet another prison term. 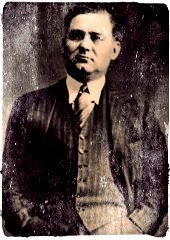 The details of this account are excerpted from “A Valentine for Bugs Moran, Part One,” published in the blog American Hauntings. The information about Moran’s life later life is from the Wikipedia entry.